Florida International University (FIU) is seeking a business partner to develop and commercialize Fluorescent and Colorimetric Sensors for the Detection of Various Small-Molecule Targets using cooperative binding split aptamers (CBSA) and enzyme-assisted target recycling (EATR)-based assays. 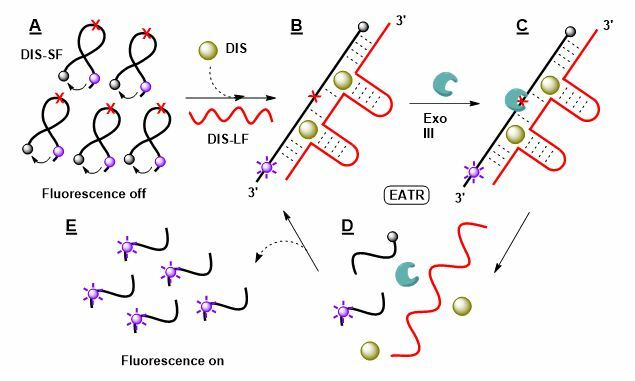 Enzyme-assisted target recycling (EATR) is an effective way to amplify signals generated from target-binding events. With this technique, a substantial fluorescent signal can be generated by a single copy of the target, thereby greatly decreasing the limit of detection. Aptamers are nucleic acid-based bio-recognition elements that can bind to a wide variety of targets, including proteins, metal ions, small molecules, and even whole cells. 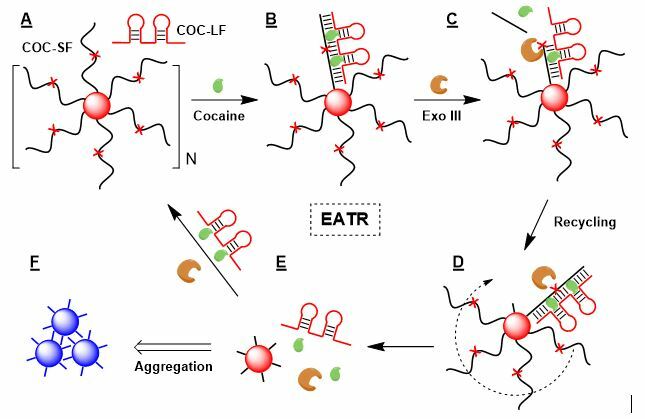 Many strategies have been employed in aptamer-based assays to achieve target detection in an instrument-free manner. In particular, aptamers can be split into two or three fragments that remain separate in the absence of target but assemble upon target binding. 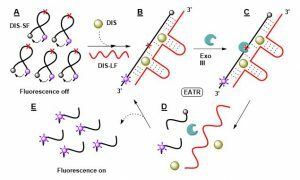 In principle, the target-induced assembly of split aptamers should be compatible with EATR-mediated signal amplification. However, it is difficult to achieve sensitive target induced aptamer assembly with conventional split aptamers with a single binding-domain. FIU inventors have developed a CBSA-based EATR-amplified fluorescence assay to quantify dehydroisoandrosterone-3-sulfate (DIS) in urine, which is a diagnostic biomarker for adrenal tumors. This assay achieved 100-fold enhanced target sensitivity relative to a non-EATR-based assay, with a detection limit of 1 μM in 50% urine within 30 minutes. 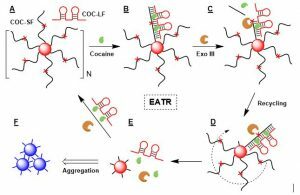 They also have developed an instrument-free colorimetric assay that utilizes EATR-mediated aggregation of CBSA fragment-modified gold nanoparticles (AuNPs) for colorimetric detection of 10 µM cocaine in 20% saliva within 20 minutes.